Most writers, at some point, will want a website. As a way to promote your writing services (e.g. copywriting, freelance writing, editing, or proofreading). As a resource for a creative writing group (e.g. letting members / new members know about meetings). As a place to let readers know more about you and your novels, and perhaps to encourage them to join your email list. As a blog where you write about writing … or about another topic altogether. As a place to publish your work or other people’s work, like an online journal or literary magazine. … or perhaps you have a different idea altogether! You’d ideally like it to be free (especially if it’s more like a hobby than part of your business). You want it to be simple to set up and to maintain. I’ve been creating websites for 16 years now, and I remember the days when I had to hand-code everything in HTML. For the past nine years, I’ve been using WordPress for almost all my websites. Whether you’re new to websites or already have one (or more! 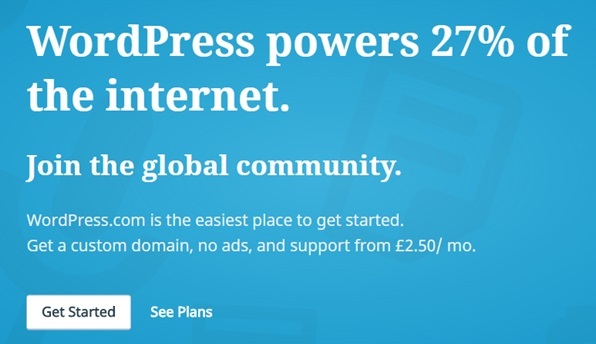 ), WordPress is a great option. Many, many websites run on WordPress – including lots of big ones like ProBlogger and Copyblogger. 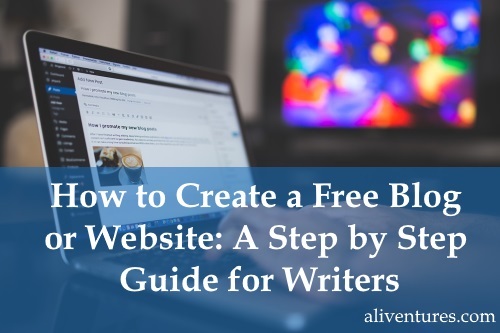 While WordPress is a great tool for blogging, your website doesn’t have to have a blog. You can use WordPress to make a “static” site (one that’s only updated occasionally, without a blog/news section) if you want. You may already know that there are two types of WordPress to choose from … and I know this is where a lot of writers get a bit stuck! WordPress.COM – your website is hosted for you (you don’t have to pay for web hosting) but your options are a bit more limited. 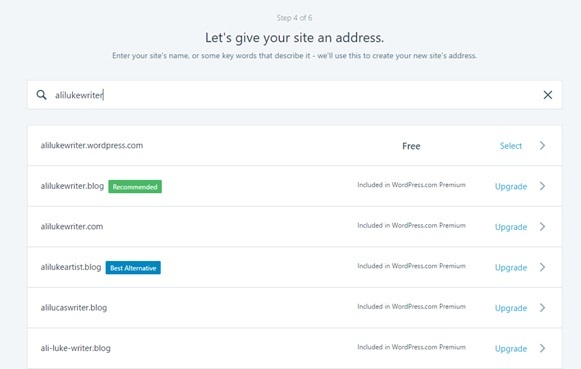 WordPress.ORG – you have full flexibility, but you need to pay for your own hosting and there’s a bit more of a learning curve when it comes to setting up and maintaining your site. You may have heard that it’s best to use WordPress.org because it’s more professional and you get full control over everything. Personally, I think WordPress.com is fine for the vast majority of writers creating a straightforward website … and anyway, you can transfer over from WordPress.com to WordPress.org in the future, if you feel the need to. 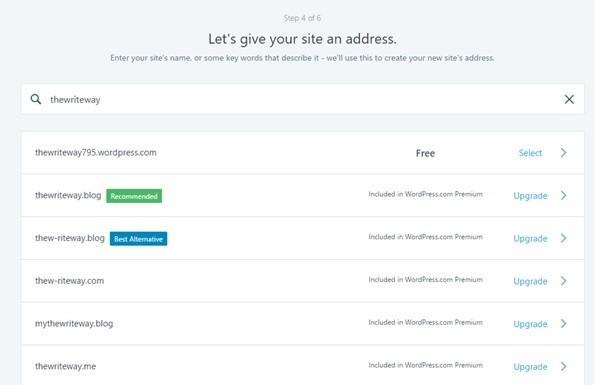 With WordPress.com, you get a free WordPress domain name. This has “wordpress” in it, e.g. aliluke.wordpress.com. Alternatively, you can upgrade to one of their paid plans (which start from £2.50/month) and get a regular domain name (e.g. aliluke.com). While a domain all of your own does look a little more professional, plenty of sites do just fine with “wordpress” in their name – David Gaughran at davidgaughran.wordpress.com is quite prominent in the indie author world, for instance. For more help naming your website, check out my post Three Different Ways to Name Your Blog or Website [Pros and Cons]. You might want to have several names in mind in case your favourite one has already been taken! 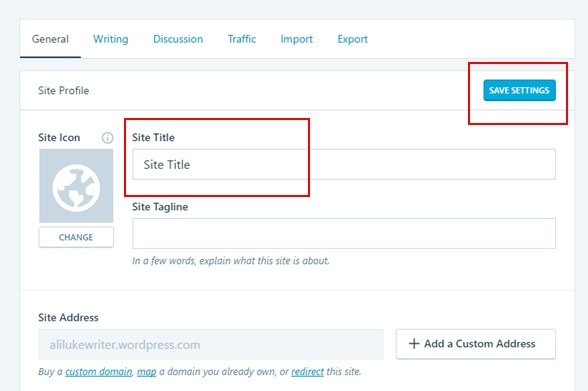 Click “Get Started” and WordPress will lead you step-by-step through creating your website. You can go back at any stage of the process. You can also change almost everything once your site is online (except your domain name). Don’t overthink this! I’d suggest “Education” (if you’re giving writing advice) or “Professional Services” (if you’re a freelance writer). You can also skip this step if you prefer. Essentially, a “website” has a static home page (you can edit it but new blog posts don’t appear there). A “blog” has your posts as the home page. 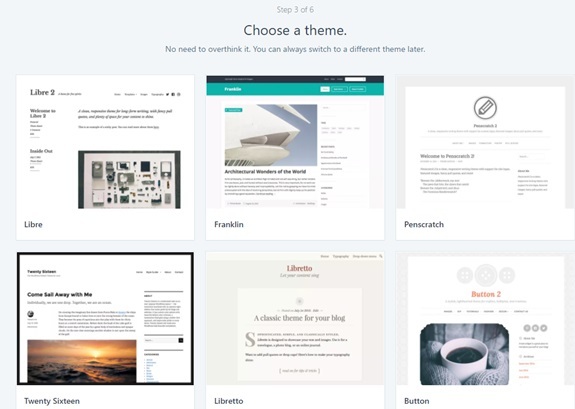 You’ll also be offered different templates – designs for your site – based on what you choose. You can change all of this once your site is live, so don’t worry if you’re not 100% sure at this point. You’ve also got the option to create a Portfolio, which is really geared towards visual artists, or an online store (which $25+/month so probably not what you want to go with)! For my example website, below, I chose the “Hemingway Rewritten” theme. This is where you name your website: ideally, you’ll have thought about this in advance. It’s really helpful for your site’s name to match its address (e.g. my site is “Aliventures” and the address is www.aliventures.com) … try to avoid having a complete mismatch here! I’d recommend that you continue to try different names for your site until you find one that’s (a) not taken and (b) you’re happy with! At this step, simply pick the “Free” plan (you can always upgrade in the future). 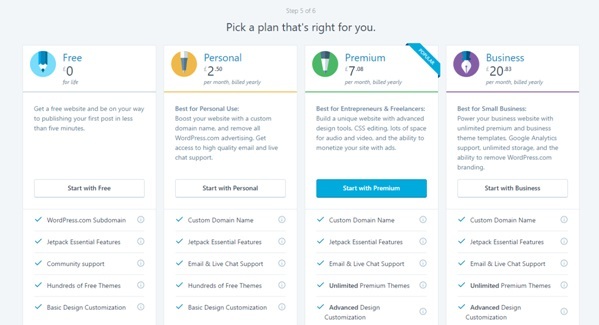 If you do want to use a custom domain name or get email / chat support, you may want to opt for the Personal plan. 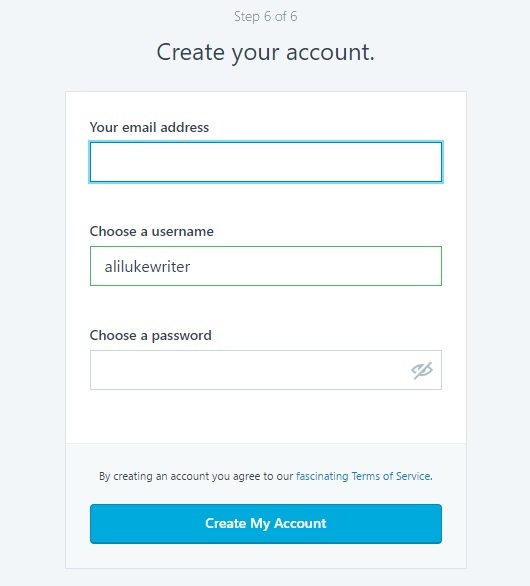 Click the “Create My Account” button. 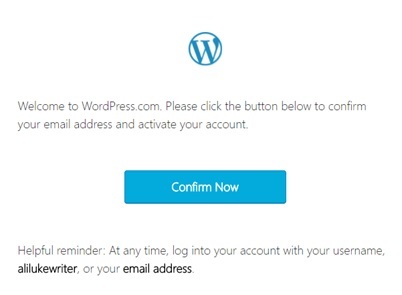 WordPress will send you an email, and you need to click a link in this to confirm your email address so you can start editing your site. You can use the links on the left-hand side to edit all the different aspects of your website. There’s quite a bit to take in: don’t feel overwhelmed! If you get stuck at any point, a quick search online will find you a tutorial or explanation. You don’t have to include a tagline but it can be helpful for readers, especially if your site title is your name. On Aliventures, for instance, my tagline is “master the art, craft and business of writing”. Make sure you click the blue “Save Settings” button after making any changes. What your website is all about / how it can help the reader. Who you are, particularly in terms of your writing. This doesn’t have to be perfect: just get something up there, as About pages are very often a cause of massive procrastination! You can edit a post in exactly the same way as a page: either go to Posts in the control panel, or navigate to the post on your website then click on the “Edit” link at the bottom. You don’t have to write anything fancy for your first blog post. You can keep it short and straightforward: let readers know that your blog is currently a work in progress, and that you plan to post regularly about writing (or whatever you plan to write about)! You can always edit or delete the post in the future. If you’ve had “set up website” on your to-do list for weeks, months or even years … you could get it done today! The whole process of setting up your website takes about 10 minutes from start to finish (faster if you don’t dither like I do about themes). Once it’s set up, allow about 15 minutes to update your Site Title, About page and first post and you’ll be finished. 🙂 Remember, you can refine these as much as you like in the future: the point is to get your site up and running right now. I’m planning to write more about getting your website finished. Is there a particular question you have or a problem you’re struggling with? (E.g. 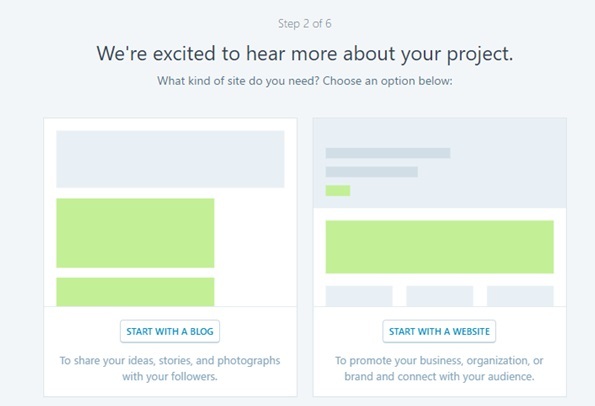 knowing what to blog about, knowing what content / pages to have on your site.) Just let me know in the comments below and I’ll make sure I cover it in a future post. Thank you for sharing this. I’m new to this and this is just what I wanted to learn for now. Good read. Cheers! It’s an in-depth blog post for anyone who wants to start a website and have no idea how to get started. 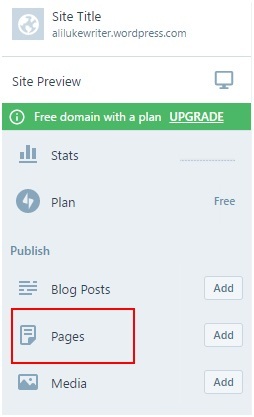 A lot of people that come across often ask about the easiest way to get started with blogging and site launching etc., but I have had my blog post on self-hosted WordPress site launch, not on WordPress.com. So this blog post is going to be a lightening rod for those who want to read the beginner’s guide to WordPress.com. I’ve bookmarked this blog post. Thanks Hassaan! I really appreciate you pointing people my way. 🙂 I think self-hosted WordPress is the very best option, but I know that hosted WordPress is a lot easier for new writers / bloggers to get to grips with. Interesting, but WordPress just gives me a headache trying to figure it out! I think it’s just too technical for me, which is why I went with another, easier option for now. Whatever works for you, Amanda! WordPress does have a lot going on, and there’s a bit of learning curve, so it’s not necessarily the perfect option for everyone. Thanks, Ali. Ever so helpful. Time spent on your site is a great school for my education in the craft of writing. I am a writer of unpublished fiction. I was really taken in by the way you explained each of the steps illustrating them with examples. I have always wondered about this issue of having an author platform. Now, I am convinced I need a website because it is as though without this, one doesn’t even exist. However, I am not so excited by the blogging aspect as I feel there is information overload already. I am not sure what I need to blog about and what frequency this has to be. I think a lot of would-be bloggers struggle with that, Ohita. My feeling is that you don’t need to blog unless you want to! If you want an occasional blog, I’d suggest having a “News” or “Latest” section where you can tell readers what’s going on in your world: that might only be once every few months. J.F. Penn, for instance, doesn’t post especially often on her blog but it still works well for her and brings traffic to her site: https://jfpenn.com. Hope this helps! Makes it all seem so simple. You’ve proven that hanging out your shingle on the web is no barrier to entry. I came here from ProBlogger, https://problogger.com/thirteen-steps-to-write-and-publish-a-free-ebook-in-thirteen-hours/, (thanks, Darren!) and glad I did. I also enjoyed the menwithpens article you referenced on Darren’s blog. Thanks Russell — and glad to help! Gosh, that post is practically vintage now. 😀 I’m so pleased it’s still proving helpful and still getting read! Good call on WordPress. I keep experimenting with other platforms (Ghost, Squarespace) and they have good qualities but WordPress is just by far the most comprehensive, flexible, and easy to use. It can do everything. Good guide! Thanks, Evan! I’m sure other platforms are sometimes the best option for an individual or for a particular type of website … but I think WordPress is an excellent all-rounder.